TempDB usage can be considered as a performance bottleneck for workloads that use SQL temp tables and table variables intensively resulted in heavy IO usage. A valuable alternatives for the SQL temp table and table variable are SCHEMA_ONLY Memory-Optimized tables and the Memory-optimized Table Variable, where the data will be completely stored in the memory without the need to touch the TempDB database, providing the best data access performance. SCHEMA_ONLY Memory-Optimized table and the Memory-optimized Table Variable are stored only in the memory with no related component in the disk. It involves no IO activity or TempDB utilization. It can also participate in the transactions without the need to log the transactions. In this article, we will prove practically that the SCHEMA_ONLY Memory-Optimized Table and the Memory- Optimized Variable Tables are the best replacements for the SQL temp tables and variable tables with better CPU, IO and execution time performance. SQL Server In-Memory OLTP, also known as ‘Hekaton’, is a new in-memory processing technology that was introduced in SQL Server 2014, integrated into the SQL Server Database Engine and optimized for an Online Transaction Processing (OLTP) workload. Memory-Optimized Tables that store its data into memory in multiple versions without causing any locks or latches on the data, as it reads from the underlying disk only during the database recovery, achieving the best performance and the most efficient data access. The second data structure is Natively-Compiled Stored Procedures that are compiled to native code (DLL) when they is created and interact only with Memory-Optimized Tables, where any call to that Natively-Compiled Stored Procedure is a call to its related DLL, providing the most efficient query processing and business logic execution. The third kind of Memory-Optimized objects are Memory-Optimized Table Variable that is created using the Memory Optimized Table Type. SQL Server generates a DLL for each created Memory-Optimized Table Type that includes the functions required for accessing the indexes and retrieving data from the related Memory-Optimized Table Variable. When that table variable is created using that table type, an instance of the table type components will be created on that table. Memory-Optimized tables can be configured as Durable to recover data in the case of any failure from the transaction logs, which is the default setting, or configured as Non-Durable where the data will not be recovered in the case of failure as the memory buffers will be flushed. The durable setting is used for tables with many updates on daily basis, where any change is required. And the Non-Durable setting is useful in the case of the staging tables that are used for temporary calculations and truncated on daily basis. Setting the Durability option to SCHEMA_ONLY value will recover the table schema only in the case of any failure, where the SCHEMA_AND_DATA Durability value will recover both the schema and the data in the case of any failure. Another option that should be set when defining non-clustered indexes, while creating the Memory-Optimized Tables, taking into consideration that the clustered index is not supported in the Memory-Optimized Tabled, is the BUCKET_COUNT. The Microsoft recommended value for that option is between 1.5 to 2 times the estimated number of unique values for the column involved in the non-clustered index. There are some Memory-Optimized OLTP features limitations in SQL Server 2014 that are resolved in SQL Server 2016, such as the supported collation for the string columns involved in the non-clustered index, where the only supported collation was the *_BIN2 collation. Now SQL Server 2016 supports all collation types for that kind of columns. 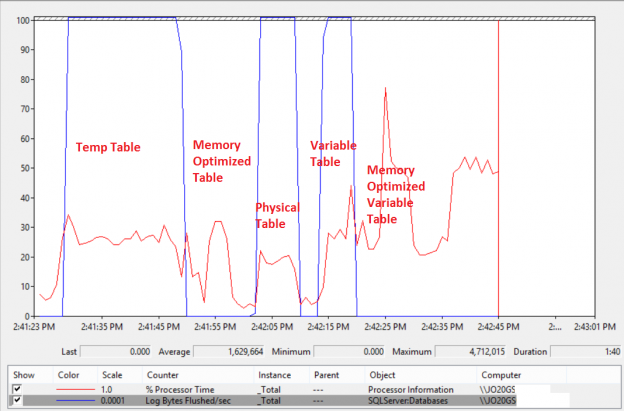 Another limitation in SQL Server 2014 is that you can’t ALTER any Memory-Optimized Table after creating it, but it is allowed now in SQL Server 2016. Nested SELECT statements and stored procedures calling and Large Objects (LOB) usage such as VARCHAR(MAX), NVARCHAR(MAX) or VARBINARY(MAX). The Memory-Optimized OLTP feature is available in SQL Server 2014 Enterprise Edition only, but in SQL Server 2016 SP1, it is available now in the Standard, Web and Express Editions too. In this article’s demo we will compare the performance of using five tables types; the SCHEMA_ONLY Memory-Optimized Table, the normal SQL temp table, the physical table, the normal variable table and the Memory- Optimized Variable Table. In-Memory OLTP is a new feature, introduced in SQL Server 2014 and enhanced in SQL Server 2016 by addressing most of the limitations, that stores the data directly to the memory, eliminating the locks and latches occurred during the reading process and providing the best data access performance. From the testing scenario we performed, it is clear that using the SCHEMA_ONLY Memory-Optimized Table and the Memory-Optimized Variable Table excelled on the rest of tables types in having the best performance that can be seen by the minimum CPU and I/O resources consumption and the minimum execution time required to fill these two tables types compared with the other tables, making it the best alternatives to normal SQL temp tables and variable tables.